Sharing with you my second card using Simon Says Stamp Friends Release! 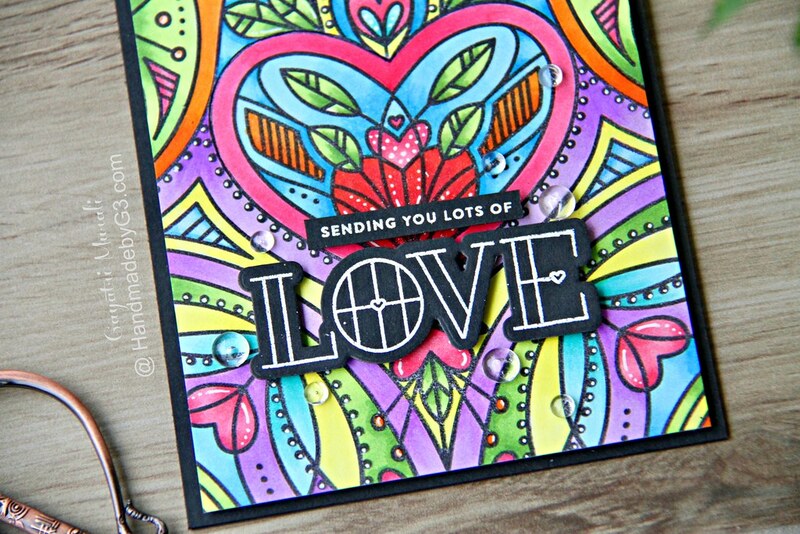 On this card, I used Center Cut Heart background stamp and Stained Glass Love stamp set and coordinating die. I love the Center Cut Heart background stamp. Absolutely gorgeous and great for colouring. I used copic markers to colour the image. I simply stamped the image using MISTI on Neenah Solar White cardstock panel. I used Simon Says Stamp Intense Black Ink. Then I pick three shades of each of rainbow colours and went to town colouring the image. It was very therapeutic colouring I should say. Then I added details using clear shimmer pen and white get pen. I trimmed the panel and adhered to black card base. 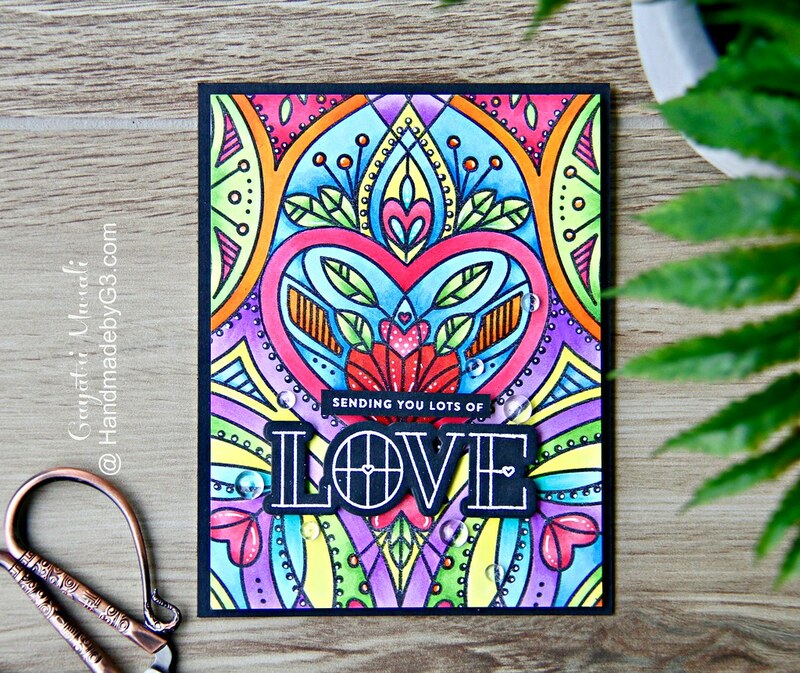 The sentiment is from Stained Glass Love stamp set. I white heat embossed the large sentiment and the small sentiment on black cardstock. The large sentiment is then die cut using the coordinating die and trimmed the smaller sentiment. Both sentiments are adhered using foam adhesives. Finally embellished the card using clear droplets. Here are some closeup of the card. 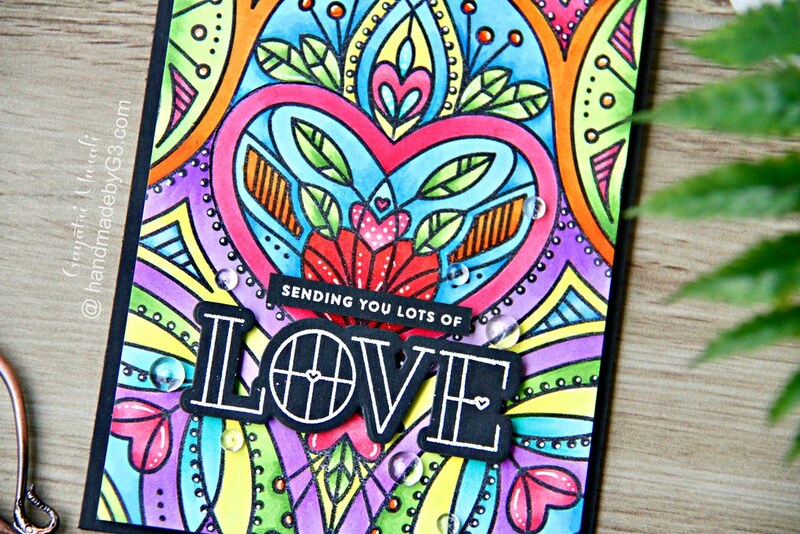 I love the bright colours and the white gel pen details. All the products used to make this card are listed below. Thanks for stopping by here. Hope you are inspired and have fun crafting. Wow! This is so beautifully colored, just love it!